Sat 27 Apr 8am from Bordeaux - Wallaceville and back. Ride Master: The ride master will be one of the long standing SANZ riders and they can change the ride on the day depending on the weather conditions. Ride Safety: Safety will be enforced by the long standing SANZ riders in each group. SANZ every "First Friday" of the month pre dinner drinks from 5pm at Mac's Brewery on the water front. The group was officially established in 1996 by six South African’s and one Kiwi. Since then two of the founding members left the group, but the rest remained to ride another day. Saturday became the default ride day. This obviously proved quite popular as the group, by the end of 2006, had a member base of 80 and growing. With this growing group it was decided that we needed our own identity, which meant a group name, a group logo and clothes. The name was not too difficult to work out and, for obvious reasons, the name we settled on was SANZ Wheelers i.e. South Africa New Zealand Wheelers. A member of the group is the expert in logo, clothing and web design and went about arranging these. As a result we have our own set of clothing, and this fantastic website that expert designed and host. 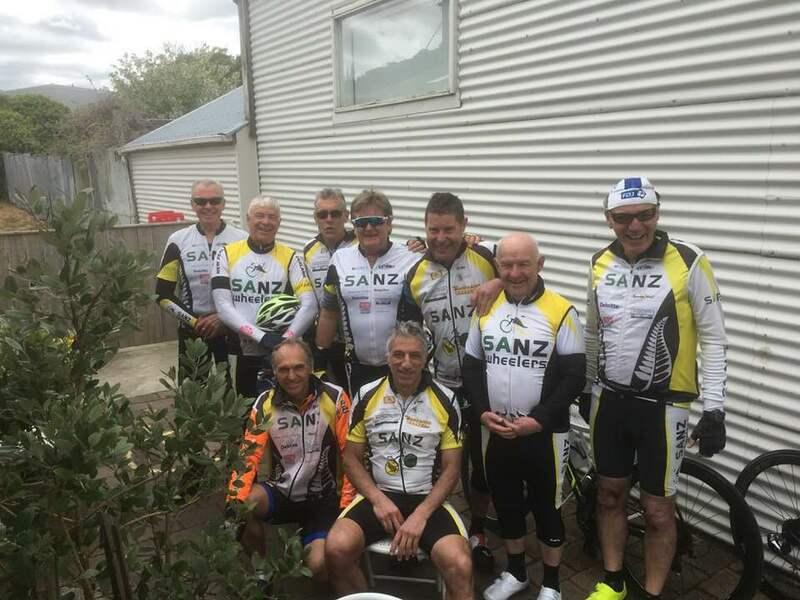 L to R: Dave Parsons, Ian Perry, Dave Masters (crouching) Ian Marshall, Evan Bayly, Dennis Siefe - El President (seated on his throne) Steve Burke, Mike O'Sullivan, Peter Churchman.